In KATIE BROWN CELEBRATES, Katie gives readers a reason to host a party every month of the year. From a festive New Year's Eve dinner to a lavish Christmas brunch, from the perfect child's birthday party to a down-home family reunion, readers will delight in Katie's signature approach to making any celebration simply wonderful. With delicious recipes, straightforward craft projects, and tips for casual entertaining, Katie shows how any host can make a delicious meal and create gorgeous ambiance without the hassle. 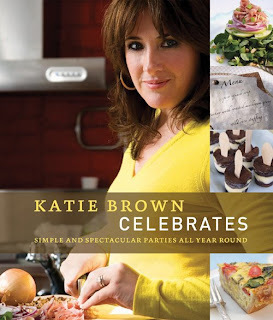 KATIE BROWN CELEBRATES is a must-have for anyone who ever gives--or has ever thought of giving--a party. I enjoyed the recipes and fun ideas in this book! Thanks to Hachette Book company I get to give away 5 hardcover copies of this book! To enter follow this blog for one entry. Leave a comment for another entry. For an extra 5 entries post about this on your blog and leave me the link in a comment. Enter by June 10th! This sounds cool! 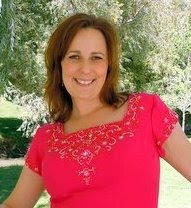 Hey...sign up as a follower on my House Queen blog! If I get enough...will have a giveaway! I would love this book! I just followed your blog and I also posted a link in my blog! Awesome idea. I love cookbooks! Sign me up. And I didn't realize that I wasn't following until just right now. So now I am following! Please include me in your giveaway. I am totally in for this one! I love cooking. I'm a follower and am adding this to my sidebar right now! Girls, this one's MINE! I love me some cookbooks! Now girlfriend, you know I follow! I followed you over here from your other blog which I follow too. You are a good leader. I'd love to win this cookbook! I would love this book. I love cookbooks. Count me in! oooh...I do love me a good party cookbook. Thanks!! Ohhh...this book sounds right up mu ally! I ♥ new recipes!!! Oh..I soooo hope I Win! I'd love some new Summer projects to try! I am NOW a follower!!!! YEAH! Cooking is my hobby! I collect cookbooks. Please enter me! shauna thanks for reminding me.. the grandkids came just after i posted about the giveaway! i got distracted! I love cookbooks. Please sign me up. This looks like a great cookbook and I have a bit of a cookbook addiction (which is funny considering my hubby thinks I only ever reheat and don't actually cook). We're buying a new house though and I hope to be doing more entertaining so this would be perfect! This book sounds wonderful. Thanks for the chance. This sounds like a great cookbook! My college student daughter and I both love cookbooks and we actually use them! I have a feeling that she and I would fight over this one, but that is OK! I would love to win a copy! 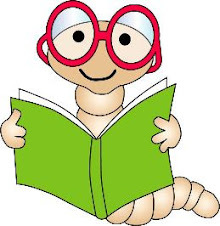 I follow your blog and love reading it! I really like Katie Brown, and I love cookbooks, great giveaway. I am a cookbook freak and now my daughter is one also. I have always enjoyed Katie Brown on the TV. Thanks for a cool chance. Love the look of this neat blog and how you are using it, Shauna!! I used to love Katie Brown's tv show so I would love to own this book! :) Thank you!! This sounds like a great ideas book! I host bunko once a year and maybe this would give me some inspiration! I just blogged about this fabulous giveaway!!! I love cookbooks...count me in please! Came here through Andrea :) Just clicked the link to follow. Thanks for having such a fun giveaway. This book looks fabulous, and just the motivation that I need to have more parties at my house. Here's to hoping I win! Looks like an awesome book...thanks for your comments on my blog! I ♥ Katie Brown, I watch her with my daughters and we think about doing all of her fun projects ... this book would be a great motivator for us!!! Seriously, what a great book, I am going to be super envious of the winners! I love reasons to celebrate, this sounds great! I love cookbooks, and collect them. This would be a great addition. Please count me in! I'm not usually into cookbooks..but this one has my attention!! Please oh please..pick me! Pick me!! With teenagers who like to have friend parties, I need this! This book looks great. Enter me please! This book sounds great, always wanting to learn and try new recipes! I love cookbooks. Enter me please. I am already a follower. I also just posted a post about the cookbook giveaway. Wow that looks like a great book. Please send one my way! Haha. Sooo cute! I love the happy quotes you post on here! Sorry about that last comment... I had BOTH of your blog pages open! I'm a dork. This book looks great and I love this blog of yours too! :) Thanks for being such a giving person! I'd love a copy, thanks! I love cookbooks and entertaining. I would LOVE to have this cookbook!! I am interested in world cuisines. So this one would make a great contribution in my library. Trying new recipes herein I could bring a smile on my guests, sharing and talking more about this cookbook. Isn't that fantastic. I love cookbooks! Sign me up I'm in!! I would be happy to tweet about your blog and great giveaways! I love a good cookbook!